Bit chilly outside so what better than to watch WHU away on the telly. Against a Norwich team who got battered last week. A Norwich team that averages 2 goals against a game. Ah, but we still have no fit strikers. Another 0-0? Lets see. After being the only reporter(!) I read last week who pointed out Winston Reid was struggling, it was no surprise (but a disappointment) for me to see James Collins come in along side Tomkins. Joe Cole also made a rare start in favour of Jarvis. Norwich started well, and had a chance saved in the opening minute. The game then swung WHU’s way for the next 15 minutes, with chances for Ratz, Nolan and Guy Demel hitting the crossbar with a header from a corner. You just thought if WHU got one, there could be loads in store. After about 20 on the clock the first half started to set a pattern of WHU having the ball a lot and neither team making any chances. This possession paid off on 32 with a cross from Ratz finding Nolan who was lucky (intelligent?) enough to keep it in and find Ravel Morrison to make it one nil. The half finished in much the same way. WHU finished the first 45 with nearly 60% of the possession (away from home ?). The second half got underway with no changes. An early freekick from a promising position for the Hammers was hit straight off the wall as was one from Downing in the first half. At least its not Noble taking them. On 53 minutes a cross from Norwich was fumbled by Jussi who then in the scramble gave away a penalty (on review post match, there is an argument for a foul on Jussi, but none from me in real time in the game) and West Ham conceded their second goal on their travels this season (both penalties). This woke up the home side and they started to take charge of proceedings. The midfield for WHU seemed the be not as fluent this half and needed shaking up. Nolan was coming deeper and deeper making it very busy and removing the outlet. With 20 to go Diame came on for Joe Cole to try and swap things around. At this time Norwich had a free kick due to clumsiness from Collins and it was sweetly taken by Snodgrass and fired in past Jussi’s left. 2-1 Norwich. The instant reaction was to bring on Carlton Cole for Collison. The game became scrappy with both teams desperate to not get lose the ball. Snodgrass had a chance to finish the game off but was too high by about 40 ft. Jarvis came off the bench on 86 for Noble in a strange decision, as Noble had once again played quite well. 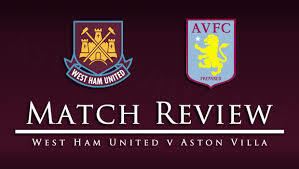 WHU had given up by then and Leroy Fer sealed the game with a third and Norwich got 3 points that you would of never seen in the first half but were well earned come 90 minutes. West Ham keep up their decades long propensity for charitable point donations for teams worse of than us. We need to hold on to what we have and not be sloppy and too relaxed all over the park. Bottom line is we are now one point off the bottom 3 and depending on what Stoke do tomorrow we could go into the international break in a relegation spot with Chelsea up next. Sam needs to weave some magic and bloody quick. Our passing is too relaxed and with the TV view we seem to pass to the player rather than in front, slowing down attacks. Ratz seems to be finding his feet and getting the crosses in well. Just need to fit him, Jarvis and Downing in the team when we have someone who can receive the deliveries. MOTM Robert Snodgrass for his freekick and all round effort for the whole game (WHU take note). Joe Cole looks on as Robert Snodgrass gives Norwich the lead. With our berth in the last 8 of the League Cup secure with 2 penalties against Burnley, and an entertaining 0-0 against Swansea behind us, I wasn’t expected a goal explosion against Villa. Villa also, are in the middle of a goal drought. This was all set up to be a cracker (!). I also base this on nearly every Villa game i’ve been to, which has been 1-0 either way or a draw. Slightly interesting change in the middle, with Collison coming into the Middle for Diame. Diame has been quite laboured recently so it probably the the right decision. Also Jarvis and Downing started. This was odd, as we had no attackers again, and it was Nolan’s go at playing up top. Not a lot to report about really for the whole game. There were two incidents in the first half both involving Andreas Weinmann. The first was when James Tomkins fell asleep and allowed Weinmann through. This produced a fantastic block from Jussi. The second was more controversial when he started to lose a race with Morrison, and started to lean into him. As Ravel tried to go round the now impeding forward, Weinmann hit the deck. Luckily Howard Webb saw the right path, and waved away the penalty appeals. I will say Ravel might always not be that lucky. Apart from the odd cross from our wingers, WHU never really bothered Jussi’s opposite number, Guzan. As usual WHU played better in the 2nd half and probably had Villa on the rack for a while, but no striker meant no opportunities. CC came on with half an hour to go, and was pretty poor, and the lack of pre (and early) season match practice is showing. The quicker Carroll is back the better. Benteke nearly won the game for the Villa with a powerful header that hit the bar. Joe Cole and Kevin Nolan also missed game winning chances, Joe hitting the keeper and Kevin hitting the hoarding. Overall , it was another point, and another 0-0 , but should of been 3 points. We are playing on a knife edge, If a couple of these draws were losses, we are looking at a different game. The quicker Carroll is back the better. Downing was great today despite some serious stick from the away support. Tomkins, apart from one lapse of concentration is justifying his selection every week. Ravel had his moments, but has gone less attack minded. I assume Sam has given him a dogging for trying to attack on his own all the time, and now he has gone the other way. He just needs to learn the right mix. MOTM today was non other than the much maligned by me Mark Noble, He was magnificent, all over the pitch and making intelligent moves and passes. If this is off the back of his recently publicised personal quest to get in the England squad then fair play. More chance of me playing in Rio than him, but if this raises his game, I’m all for it. BUT, stop the free kicks son, its really not you ! 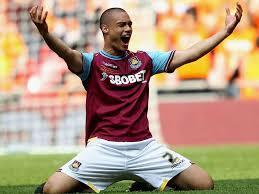 One concern to end on, Winston Reid looked like he was struggling through the game. This could be a wory that we really pay for later on. With West Ham last game being the magnificent win against Spurs at the Lane, most WHU fans ay the ground had already decided that we already had our name on the 2015 Champions League already. We were unbeatable, and didn’t need strikers and could score at will. And we had this weeks current English wonderkid, Ravel Morrison. Talking of which, this kid has had a couple of good games and scored some goals. He is also only now delivering on his promise that started at Man U all those years ago. Lets not get carried away just yet. Unlike the Sky Cameras, who decided to chase him around the pitch while he was warming up prior to the match. Surely the pitch is the workplace until the game is over ? Anyway, Man City stood in front of this assault on Europe. We lined up much like against Spurs, leaving two strikers out of our pool of 2 fit / able strikers on the bench. Welcome back Carlton. As regular readers know, this for me , is some sort of religious resurrection :). City had no Zabeleta or Kompany at the back, which was encouraging. The game was underway at a high pace, and the scene was being set. David Silva running the show and WHU chasing shadows. We needed to get the ball and that was proving hard to do. We did we had a couple of forays into the City half but that was about that. On 16 mins a great dummy by Negrero left Aguero free to open the scoring for City. West Ham tried to respond but our 6 man midfield were struggling to get involved, which probably tells you which way the game was going. Come half time there had been a few flashes of light, through Morrison and Ratz, and I was happy with one nil. My happiness was put out 5 minutes into the second half, when a Silva free kick found Aguero’s head for the second. Poor defending all round allowed one of the smallest players on the pitch score his first headed goal in the Prem. All of a sudden WHU woke up, and our midfield started to fire, with Noble mugging off Yaya Toure a couple of times, which cheered me up no end. Just before the hour mark, RVT fires in an overhead kick past Hart after a nice dink in from Morrison. 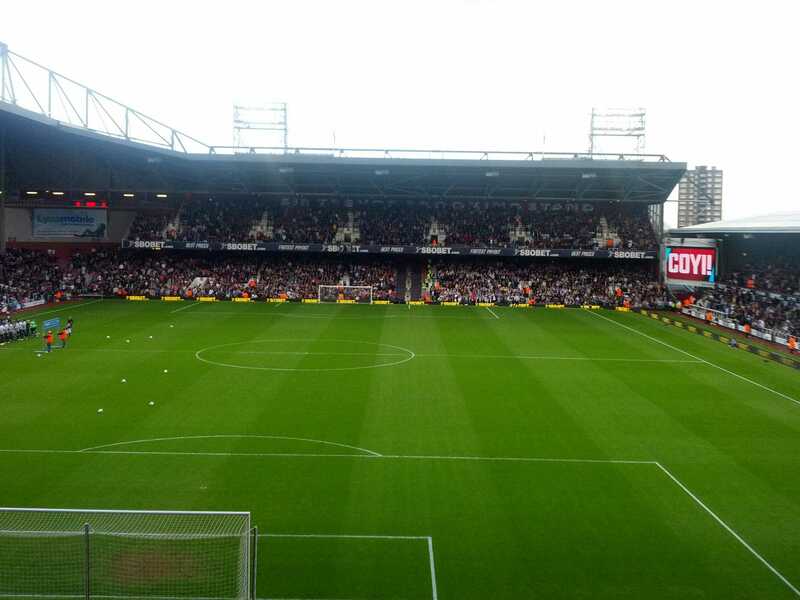 Upton Park goes wild and not just because CC is warming up ! We then push on and on and City start to falter and make mistakes. This is on like Donkey Kong. 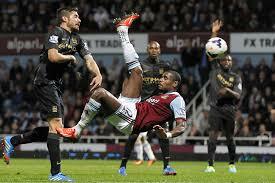 But it wasn’t to be, Demel got injured and had to leave for O’Brien, and it upset the balance a little. The knock on effect was we run out of puff, and still Sam left the strikers on the bench. This is where the issue was in reality. At 65 he replaced RVT with Jarvis, when maybe Petric or Cole and the long ball may of been the better option of getting a draw. On the same point, I am no RVT fan but no way should he have come off at any point yesterday. City smelt the fatigue and Silva scored an absolute cracker to finish the game off on 80 minutes. So what happens next. Well Sam has got Carroll back soon, he has a fit CC and Petric, and therefore we need to change this ridiculous formation. For most of yesterday Diame and Morrison were playing up front and it helped neither. Back to the young lad, he played OK yesterday and in the second half passed the ball around really well, which is something he needs to do. MOTM: Jussi played well, as did Tomkins and Ratz (after a dodgy start). But David Silva was just unplayable yesterday, and therefore gets my vote. Overall, our first season back in the prem has been a success, with Big Sam steering the team to a top 10 finish, in allegedly the best league in the world. 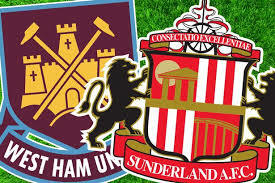 We have a become a hard team to break down, but we do have a limited attack, unless Andy Carroll is playing. This means our league position is about right. For Sam then, we have to take on board that in the last two seasons he has done exactly what has been asked of him, and delivered in both years. But he needs to liven up play to get more fans on side. For the players we shall go in shirt number order. 4. Kevin Nolan. Big Kev ended the year on a high, with a hatrick against collapsing Reading. Seems to drive the team, but could do with getting in the gym a bit, if you ask me. Double figures from midfield not too shabby though. 7/10. 16. Mark Noble. The local boy had been an ever present until an injury took him out for a few games. Lots of puff, not nearly enough end product. Can do it, and once he gets it in his head he can do it. Needs to realise he is not the best player in WHU and just needs to get his head down and crack on. 6/10. 17 Joey O’Brien. Last years freebie becomes this year’s secret weapon. Plays really well on the right, not so good on the left but capable. A good addition to the team. 7/10. 22. Jussi Jaaskeklainen. Robert Green’s replacement played every PL game this season, and won us about 10 points in my estimation. A couple of mistakes are allowed in a season like this. Well played Sir. 8/10. 32. Gary O’Neill. Never let us down as a sub, but really took his chance in the middle when Noble was out. Should get more game time next year. 7/10. Abou Diarra – nice one. Dan Potts. Your time will come. Elliot Lee. Maybe, lets see. Chamakh. Lol. Lets hope he wasn’t expensive. Last but not least the Chairmen. Lets not forget, this season we have gained a new ground, as well as bankrolled the signings (re signings) of Carroll, Cole, and secured Diame. Also, for a man in his late 70’s David Gold is fantastic on twitter (dg). The other Dave has kept his self out of the media and left it to Karen, which is probably right. If the 3 of them play this ground business well, we could be up there in a few years. See you next season (this year was 7.5/10). COYI. After our well earned point (some would say moral victory) against the Champions elect earlier this week, I really fancied us to continue on to win against Wigan this weekend. It’s always a close game, in fact we were two nil up and then went on to lose to a last minute goal in May 2011 which saw WHU relegated, and Avram Grant getting home under his own steam. This time around, we are on an unbeaten run of 4 games and Wigan are staring down the barrel of relegation, with an FA Cup final to look forward to. Sam made no changes to the starting line up, but Joe Cole was added to the bench. The opening salvos from both teams set themselves out to attack. West Ham a chance with a flashing header from Collins just going wide from a corner, and Maloney for Wigan got on the end of a great through ball only to be blocked by Jussi. From then on WHU seem to take control and it was only a matter of time, although the inevitable goal was a little unexpected. Matt Jarvis seem to be having a field day down the wing, and once again in the 21st minute he crossed in the ball after a great burst out of the midfield by Diame. This cross missed about 2 Wigan players, Diame and Nolan lashed at it to no avail, and then the Latics goalie let it go past him, to open the scoring for WHU. For all their dominance, WHU didn’t capitalise on this lead. The second half was more of the same and then Sam did as Sam does and swapped out the whole midfield, with quick succession, O’Neill, Diame and RVT (who was woeful) were replaced by Noble, Joe Cole and Collison. Notice Nolan was not replaced, even though he seemed ineffectual if I’m honest. Again. Anyway, WHU went into free fall and if it wasn’t for Jussi, we would of been behind, as Wigan threw everything at us, and we had no way of stopping it. This game had draw written all over it until with 10 minutes to go a long free kick found the ever impressive Carroll who moved it on brilliantly for Nolan to volley it in for his 100th premier league goal, and some justification for him still being on the pitch. So WHU win 2-0, and Wigan might not get out of the hole this time. They did not have the luck, and being a WHU fan, I know what happens when you are down there. You cannot buy luck or goals. However you can buy players and there are a couple I could see playing in claret and blue if Wigan do go down ! Maloney for one. We have all but secured our position in the league for next year, and can look forward for a change. Being in the top half has a nice feel to it as well, so lets hope we can stay there. MOTM: Jussi Jaaskelainen. Just pure class again and kept us in the game when BFS block replaced a midfield unit. Gary O’Neill gets a shout as well, for his performance up until he was subbed.